Investors are retrieving their capital from Greece, Italy and Spain and other European Union countries to be channelled into Vietnam this year, said Radio the Voice of Russia on March 14. Experts said Vietnam’s socio-political stability is an important decisive factor for investors. The country’s poverty rate fell from 58 per cent in the early 1990s to 9.5 per cent in 2010. In addition, Vietnam jumped 16 steps to rank 61st in the 2010 Legatum Prosperity Index Table Ranking of the London-based Legatum Institute. According to a Bloomberg News forecast, in future, Vietnam’s economic development prospects will be ranked third in Asia after China and India. In the meantime, Seekingalpha website said Vietnam has recently captured the attention of investors because of its sizeable population of 90 million and its rapidly growing middle class. Because Vietnam’s population is young more than half the country is under 30 this market-socialist nation is likely to benefit from a demographic dividend. Going forward, Vietnam’s inexpensive labor force will continue to be attractive to foreign multinationals looking for an alternative to China’s rising costs. Another potentially profitable field for investment is real estate. 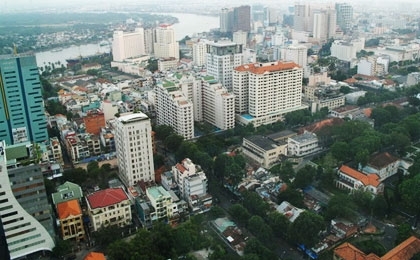 According to the latest survey released by the Association of Foreign Investors in Real Estate (AFIRE), Vietnam ranked as the fourth most attractive emerging market for real estate investment in 2011 behind China, India and Brazil.